Ever wonder how to grow giant sunflowers? 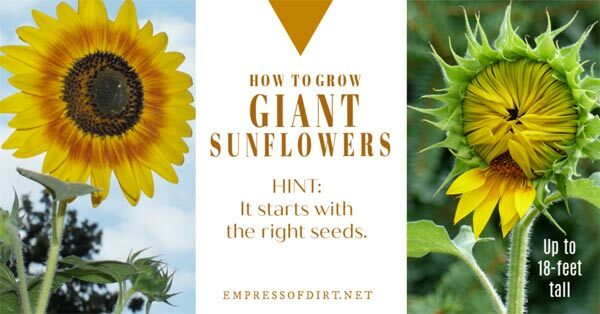 These insider tips share how to pick the right seeds and provide the right conditions to grow tall sunflowers with massive flowers in your garden. For more tips, also see How to Grow Sunflowers and What to Avoid. 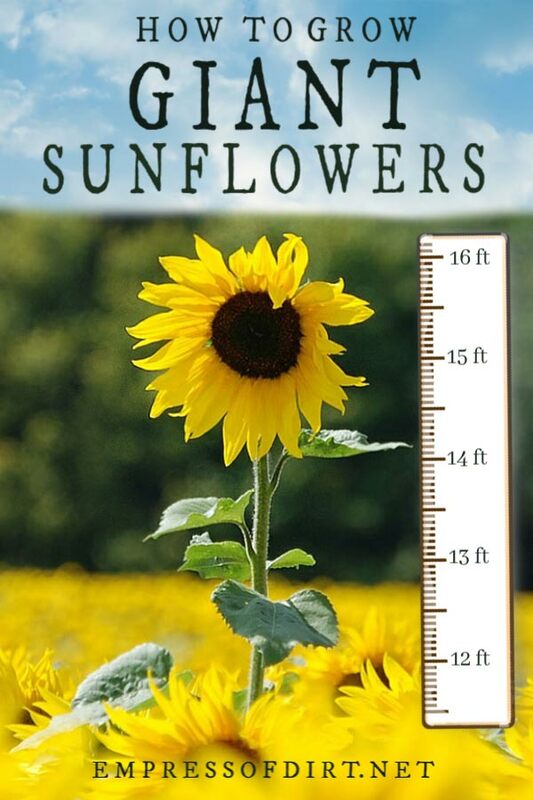 Every summer new photos appear of gardeners standing next to massive sunflowers in their gardens, reaching heights of 10 or 12 feet or more. But how do they get sunflowers to grow so big and tall? I found a bunch of tips for growing these towering flowers and there are a few very basic must-dos. If you are hoping the get in the Guinness Book of World Records, it’s probably going to take a lot of trial and error over a number of years. The current record-holder managed to grow a 30-foot sunflower, and that, reportedly, was after years of testing and selective seed-saving until he had incredible seed stock and a stellar growing season. For the rest of us who may just want a fun conversation starter, or to hold a friendly competition with a neighbour, these tips will help. The first step is to pick your goal. Do you just want the tallest sunflower possible? If so, there are varieties that grow straight up and produce relatively small flowers up top. If you want great height and huge flowers, a variety like Paul Bunyan is a good choice. It can produce flowers that are 18-24-inches in diameter and reach heights of 15-18 feet! Crazy. Along with the tips, I’ve listed seed suggestions below. This is the most important tip: genetics matter! You have to start with a variety of sunflower that can grow tall. Forget the dwarf varieties (which do great in containers), and look for types with words like giant, mammoth, kong, tall, monster, and so on in the either the seed name or description. While researching this, I noticed height listings vary—and I’m sure growing results do too—but these will give you an idea. ABOUT THE NAMES: It’s the wild west when it comes to sunflower names. Several seed companies may sell essentially the same sunflower seeds under different names or variations of a name, and sometimes they use the same name but, clearly, based on the images, it is not the same seed stock. So, check before you buy to be sure it’s the type you want. Sunflowers need a lot of sun! The ideal location provides 6-8 hours of sun a day in a sheltered location so there’s low risk of wind or storm damage. Timing matters: this shows you how to know when to plant sunflower seeds. It’s all about root space! Growing sunflowers in the ground in rich, well-draining soil, free of rocks or tree roots, is key. Any obstacles in the soil will inhibit root (and plant) growth. You can grow sunflowers in containers, but that’s best for dwarf varieties, not when size is the goal. This has more tips for where to plant sunflower seeds. I know, I know! We hear this all the time in gardening. But soil is key. 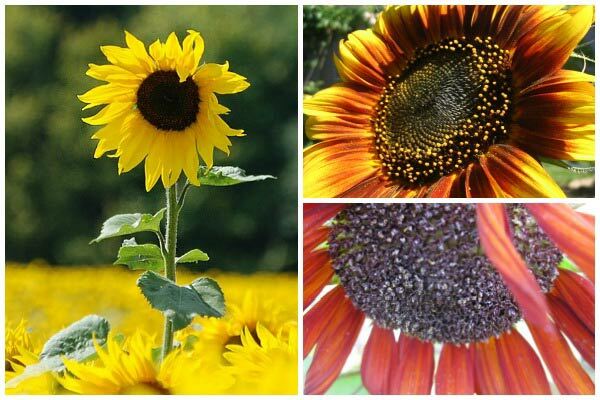 Sunflowers are hungry plants, needing a lot of nutrients to grow those big flowers and thousands of seeds. Step one is to provide nice, loamy soil. My garden soil is terrible, so I add loads of homemade compost to the soil to gradually build it up each year. This has more tips for how to plant sunflower seeds. Most sunflowers can grow anywhere from 6 to 36-inches apart, but, when you want to grow giants, it’s best to allow as much room as you can. Allow space for the roots to spread several feet in any direction, both horizontally and down into the ground. See this list for plants that don’t grow well near sunflowers and others that do. The taller the sunflower, the more vulnerable it is to wind breakage or snapping under the weight of a climbing squirrel. If you can, grow your sunflowers near a tall fence or wall, out of direct wind. While sunflowers do not like swampy soil, neither will they tolerate drying out. An inch of two of compost or finely chopped bark mulch will help keep moisture in and gradually decompose to amend your soil. If you are going to add any support stakes or tall cages, it’s best to add them when the sunflower is young and the roots are small. The older sunflowers get, the fussier they get, so any disruptions later on should be avoided. The number one killer of sunflowers is pests! The problem begins after sowing seeds. Birds, squirrels, mice, and all their distant cousins smell those seeds from far and wide and come ready for a snack. At seedling stage, birds fine them irresistible. Cutworms can also take them down. Place covers over germinating sunflower seeds and keep them protected until they are several inches tall at least. On the flip side, the hungry critters return when the flower heads start turning to seed. Use bags or netting to protect the flower heads. Or let them dine. You can read more on pests and diseases that affect sunflowers here. Besides choosing super seeds, proven to grow big and tall, fertilizer is key to maximizing the height. I am not a fan of adding a lot of fertilizer to anything because of the environmental repercussions, so do your homework first. I have not tried any of these things, but here’s what others say they use: compost, kelp, fish fertilizer, and a product like Osmocote. I also found tips saying to dig shallow trenches in circles around the plant—about 12 to 18-inches out, and add liquid fertilizer there, to reach more of the roots. It’s easy to over-do fertilizer, hurting both the plant and the soil so follow the instructions on any product you use. More is not more with plants: they can only absorb what they need when they need it under the right conditions. I mentioned that sunflowers do not like to dry out—or get waterlogged—and that means keeping the water nice and even, right through the growing season. As the plant gets tall and starts to bud, you may notice that sunflowers start needing more water. You may need to increase your watering routine, especially during dry spells and heat waves, which tend to go together. If you’re worried about over or under watering, a moisture meter is your best friend. This is an extra tip if you really want height beyond anything else. To keep your sunflower putting all its energy toward height, you can remove any extra side shoots, and grow just single stalk with a flower on top. You will end up with a giant bean pole, but, if this is what makes you win the neighbourhood contest, so be it. TIP: Chickens love sunflower leaves! If you enjoy tips like this, sign up here for the free Empress of Dirt Newsletter.